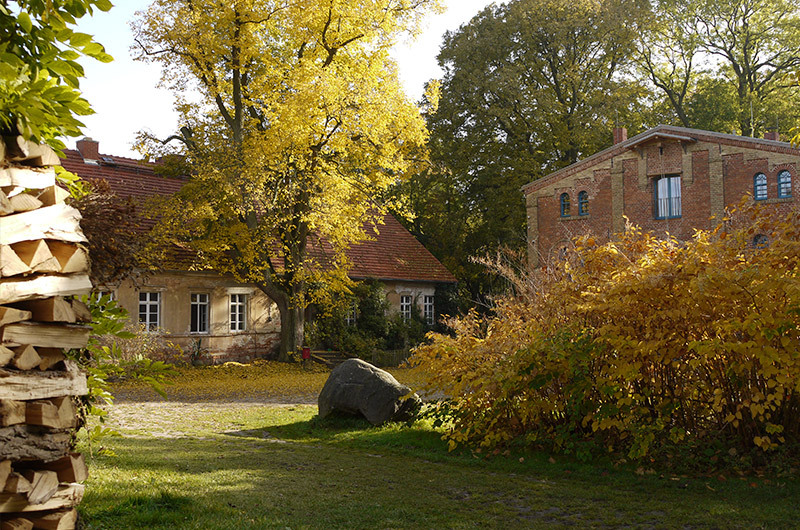 Join Elizabeth Smullens Brass, for autumn yoga intensive in the beautiful Uckermark. Deepen your yoga practice with 10 hours of yoga over 4 days and 3 nights. In between classes, go for a relaxing walk or hike or enjoy the stunning nature. We will enjoy a campfire or sauna in the quiet evenings. Located near the village of Frauenhagen, in the middle of the nature reserve Schorfheide-Chorin, Panta Rhei, is 90 kilometers north of Berlin near the Polish border. The mill uses the water of the Welse river, in Angermünde, Uckermark. It is a thoughtfully renovated and modernized old water mill with comfortable bedrooms and bathrooms, a traditional Mongolian yurt, a sauna in a Bauwagen, beautiful gardens, and a river that spins the mill wheel which can be viewed from the dining room. Organic vegetarian meals with mainly regional products and from the Mühle’s own garden will be served. Sleeping options in the millhouse are limited to 14 people only in double rooms with shared bathrooms. The classes will be taught in English, with some German translation. We start on Thursday at 4 pm with an asana class followed by a welcome dinner. The workshops ends on Sunday with an asana class in the morning, followed by a goodbye lunch. Refund Policy: Reserving your place is binding and the retreat fee cannot be refunded in case of non-participation. If you need to cancel, you have the option of organizing another person to take your place (fee €20). This option is only available up to 7 days before the retreat. From Berlin, it takes about 1.5 hours to drive (depending on traffic). The train to Angermünde takes approx. 1 hour and leaves hourly.